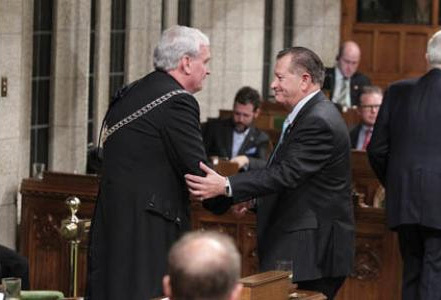 LaVar Payne, MP of the Medicine Hat constituency, gives Sargeant-at-Arms Kevin Vickers words of thanks in Parliament on Oct. 23. LaVar Payne, Member of Parliament for the Medicine Hat was on Parliament Hill on Oct. 22 when a gunman shot and killed Cpl. Nathan Cirillo, who was guarding the National WAr Monument in Ottawa. The gunman then stormed Parliament Hill and was shot dead by Sargeant-at-Arms, Kevin Vickers. Last week, Payne issued a written statement thanking people for their support and in thanking Vickers for his bravery. “I received a number of emails and calls from concerned individuals, including many constituents. I thank you all for your concern, and appreciate that you are in solidaritt with us as we lived through the events that transpired in our Nation’s Capital,” wrote Payne. Payne went on to recognize Vickers in his statement. Payne also noted the two fallen soldiers who gave their lives that week at the hands of radicalized extremists, as well as the officers who attempted to apprehend the gunman.